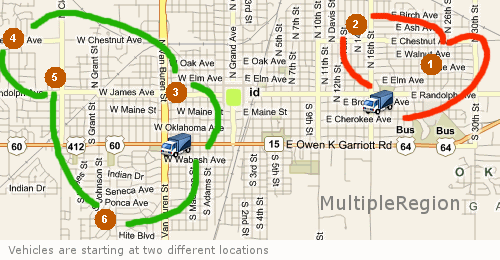 Every time you need service a number of locations with a fleet of vehicles you have a vehicle routing problem. The question will be which vehicle goes where and the goal will be minimizing the cost of travel and distribution. 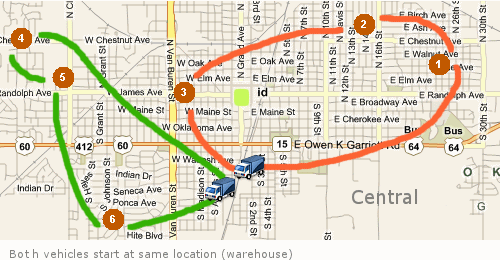 TrackService can auto-dispatch stops and perform route optimization for each vehicle's route. Since there can be different logistics in vehicle routing, we've added the DispatchMode property to accomodate different situations. The vehicle routing problem (VRP) can have several variations (VRP with pickup/delivery, VRP with TimeWindow, VRP capacitated, etc.) and the DispatchMode is to help with these situations. Our logic employs several factors such as vehicle position relative to stops, time window, maximum number of stops vehicle can make in a single route and total amount of time vehicle can be on the road in calculating the route. All of these decisions are helped by our built-in algorithm while DispatchMode hides the complexity of vehicle routing and lets you focus on other tasks. Depending on the situation and the vehicle's start/finish locations you should use different dispatching mode. If you are not sure, just leave mode on 'Auto' and TrackRoad will find best mode. 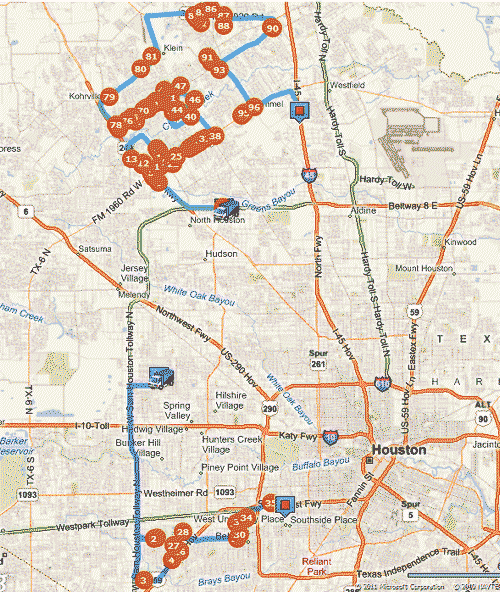 Image below is a great example on how the stops were distributed among two drivers in the Houston area. 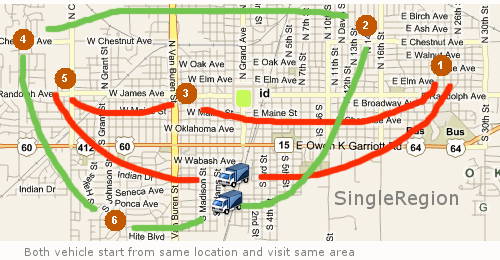 Intelligent Dispatching: the vehicle to the north gets the locations in the north. And vehicle in the south gets those in the south. When vehicles start from same location such as a warehouse you may use Auto, EqualHour or EqualDistance mode. This is one of the best situations and can give optimum results since all vehicles are starting at the same location. In the event, vehicles are scatterd through different regions. TrackRoad can pick the best vehicles for the route and assign best matches. Use MultipleRegion when vehicles are starting from different locations. The same region can be visited by different drivers in SingleRegion mode. SingleRegion is not a very effiicent way of routing. However, some situations may require this way of routing.